The Shell Starship Initiative Truck on the floor of the Prime F. Osborne III Convention Center in Jacksonville, Florida, after its six-day coast-to-coast run. JACKSONVILLE—The Shell Starship has landed. The one and only Shell Starship concept tractor-trailer pulled in here on June 3rd after a six-day run from San Diego to Florida. The slippery sleek rig is the brainchild of long-time trucking efficiency advocate Bob Sliwa, president of Airflow Truck Company, who hand-built the vehicle and drove it across country with his faithful, 12-year old German Shepherd riding shotgun. 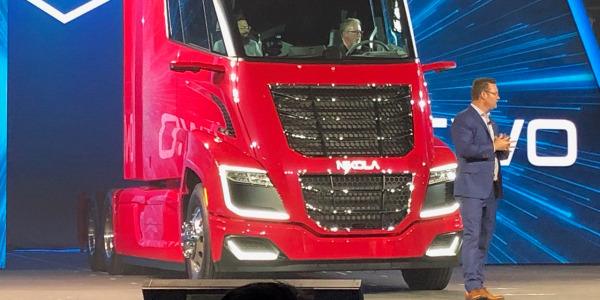 Sliwa has built concept trucks in the past, including his first “Bullet Truck” project, which was an early effort to push the boundaries on Class 8 aerodynamics. He’d been planning a new concept that could incorporate the technological advances that have overtaken trucking in the years since the Bullet Truck was on the road. It was a meeting with Dan Arcy, Shell’s Technology Team Leader, that accelerated the Starship project to warp speed. 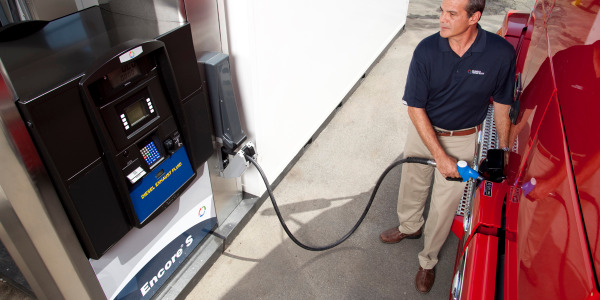 After talking with Sliwa, Arcy realized Shell had a unique opportunity to get behind the truck and really push the technology envelope and see what was possible in terms of both fuel economy and freight efficiency in real-world trucking applications. 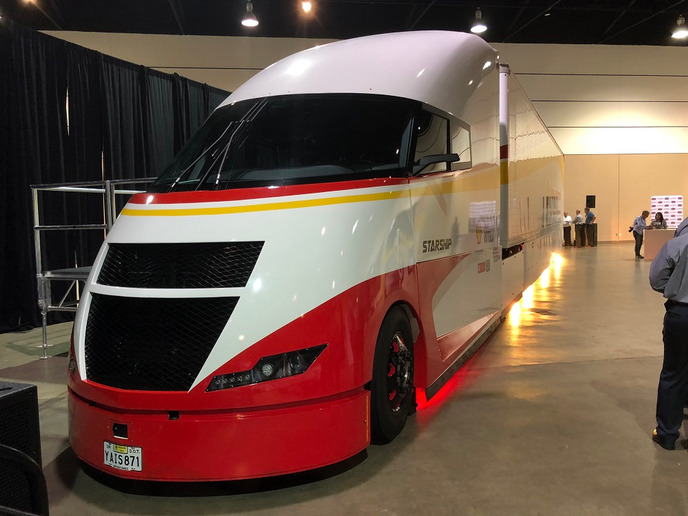 With Shell’s backing, Sliwa’s team went into overdrive, building a “hyper” aerodynamic Class 8 tractor with the ultimate goal of a coast-to-coast drive to promote both the technology deployed and the results it delivered. 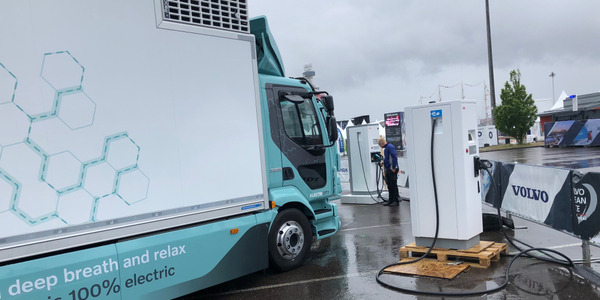 The idea was to send the message that significant strides in fuel economy, freight efficiency, and carbon emissions can be attained with products and components readily available today. The Starship is an interesting blend of cutting edge and conventional technology. While the exterior of the truck is indeed futuristic, underneath its carbon-fiber composite skin, it is a very familiar beast. The futuristic, aerodynamic body is mounted on a conventional “C” channel steel frame with a 6x2 drive axle and electric tag axle. T6 Ultra 5W-30 motor oil, a low-viscosity API FA-4 spec, which Arcy said is specifically formulated to reduce parasitic drag inside the engine, and is protected as well by Shell’s most advanced, nitrate-free engine coolants. 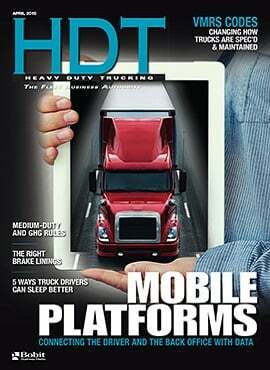 The conventional and cutting-edge tech mix continues outside the truck, too. Up front, the large grill is complemented by an active cooling system with variable-pitch cooling fins. 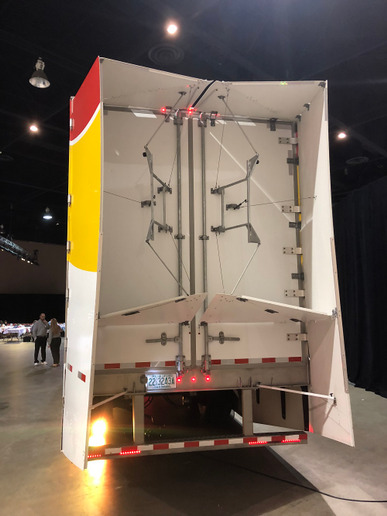 At the rear of the truck is a modified trailer tail system that Sliwa extended both outward and downward to integrate with the extremely low, full-length trailer side skirts and gap-extension system. Although the skirts have a ground clearance of approximately 3 inches, Sliwa said he experienced no problems with railroad tracks or debris in the road during the drive. Inside the truck, the cab is spacious but Spartan and fitted out for passengers instead of as living quarters. 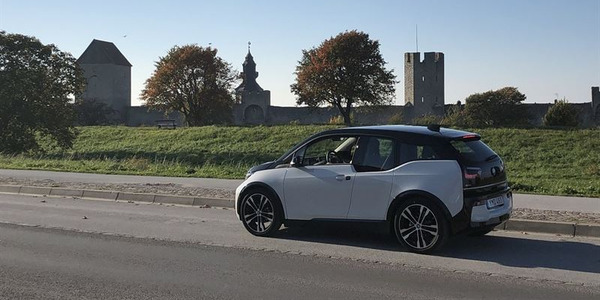 Up front, the dash and instrumentation is strikingly modern, with large, easy-to-read display screens lit with brightly colored graphic icons. Crisp rear-view camera monitor screens are offset on each side of the driver’s seat. 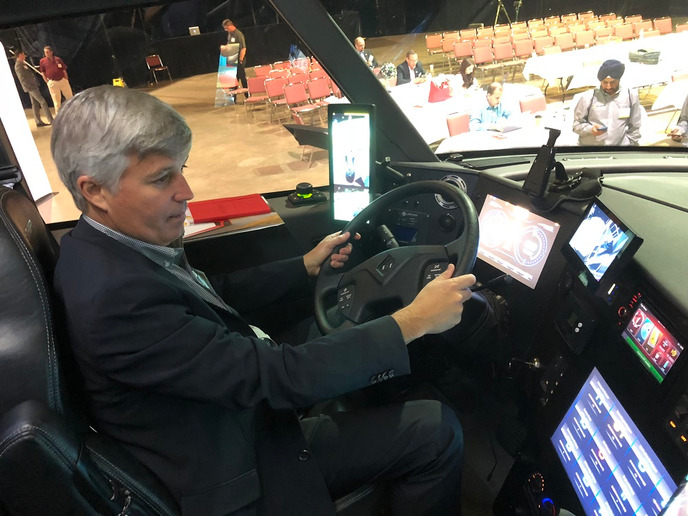 Carlos Maurer, president of Shell Lubricants Americas, sits at the wheel of the Starship truck during a press event in Jacksonville, Florida. Over a week ago in San Diego, the Starship was loaded with 39,000 pounds of rocks in boxes. The rocks weren’t just dead weight, however. They are “clean marine” materials that will eventually end up in an artificial reef being built off the Florida coast. As Sliwa set off eastbound on I-10 across the lower continental United States, he was accompanied by a motor coach of officials from the North American Council for Freight Efficiency. They were along to observe and validate the truck’s performance during its six-day drive. The truck stopped five times during the drive, in Gila Bend, Arizona, Comfort, Texas, Houston, Biloxi, Mississippi, and finally Jacksonville, for publicity tours and public relations meetings. At each stop, the NACFE team analyzed the day’s drive and recorded all of the truck’s operational data compiled during the previous drive. 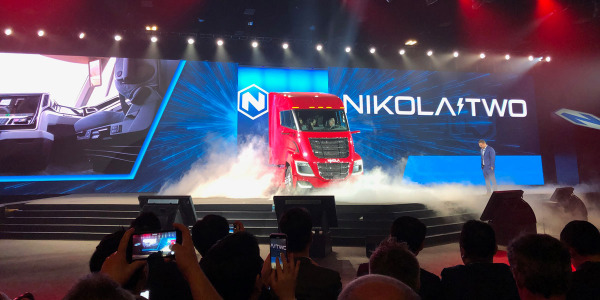 At a high-profile event at the Prime F. Osborne III Convention Center in Jacksonville, NACFE Executive Director Mike Roeth unveiled the impressive numbers for the truck’s run. 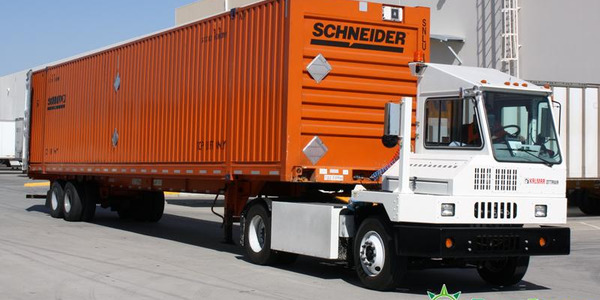 According to NAFCE, for the cross-country drive, the Starship truck attained 178.4 ton-miles per gallon for freight ton efficiency – a nearly 248% improvement over the North America average freight ton efficiency of 72 ton-miles per gallon for trucks. The aerodynamic device at the rear of the Starship truck was modified for greater fuel-saving efficiency by Bob Sliwa. 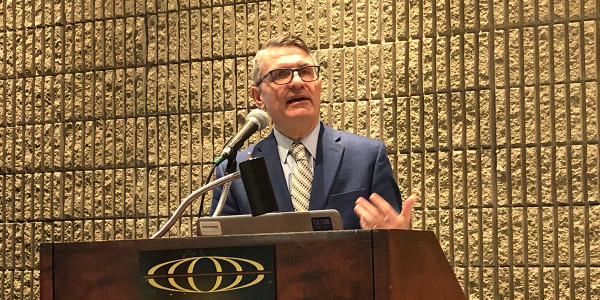 Roeth said NACFE considers freight ton efficiency a more relevant statistic for judging the energy intensity associated with moving cargo from point A to point B since it combines the weight of cargo being moved with the amount of fuel consumed. 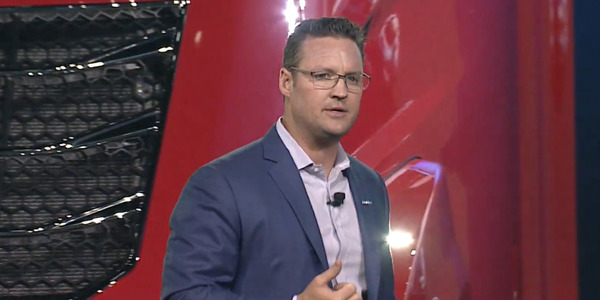 All told, Roeth added, the final total truck and cargo weight was close to 73,000 pounds, which is 28% heavier than the average total GVW of 57,000 pounds for a U.S. on-highway Class 8 truck. The payload weighed in at 39,900 pounds, 77% more mass than the U.S. average payload of 22,500 pounds. 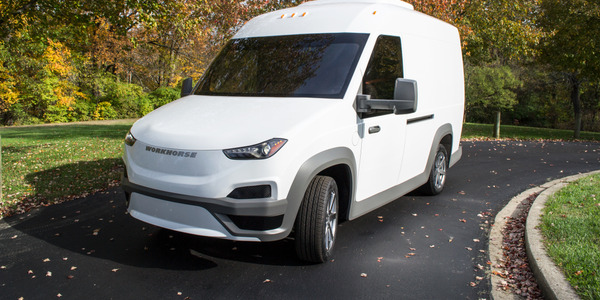 For the entire journey, which included vastly different road, weather, and terrain conditions, the Starship truck’s total average fuel economy was 8.94 miles per gallon, compared to the average U.S. fuel economy for transport trucks of 6 mpg. The best fuel economy attained during the drive was 10.2 mpg. 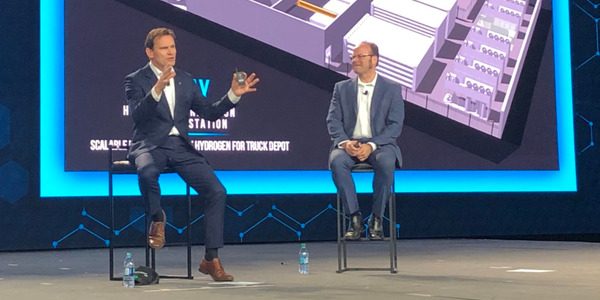 In terms of calculating estimated CO2, Roeth noted that if all 2 million trucks operating in the U.S. today reached the overall fuel economy and freight ton efficiency performance of Starship, they would emit an estimated 229 million less tons of CO2 into the atmosphere per year. In addition, a reduction of 229 million tons would correspond to a huge 60% reduction in CO2 emissions from the U.S. truck fleet, further highlighting the benefit of the enhanced economy and increased loading strategy adopted within the Starship Initiative.